The other day I wanted to make a little stuffed friend for my daughter. She has plenty of stuffed friends, mostly of the store-bought variety. My Amma sent her a sweet stuffed lamb, but since it came over from Iceland I needed to stuff it and sew up the opening. Since I still had quite a bit of a bag of stuffing leftover I started searching Pinterest for easy stuffed friend tutorials. I came across a simple owl and the pattern was titled "Easy" Owl Pattern... easy sounded right up my alley. I used 2 fat quarters, with plenty of fabric leftover and a few scraps I had. I modified the nose shape and eye placement slightly and omitted the feet. It came together very easily and I think I spent maybe 2 hours on it altogether... complete with toddler interruptions. "What are you doing Mommy?" "Is it a surprise for me?" "Ooooo pretty flowers" all while pulling at strings and pins and fabric and scissors. I really wish I had used stitch witchery for the eyes, sewing around the smallish circles was less than fun for a beginner, but overall it was a fun little project and I'm hoping to make more little friends for her. Visit the link below for the free pattern, I cut the nose in a diamond shape and placed the eyes right up against the upper edge. 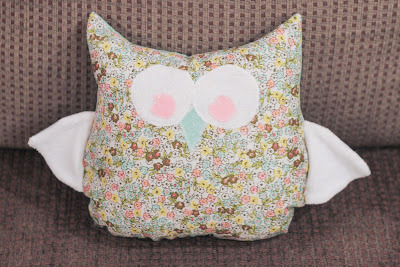 Sweet project - I can see her using her new friend as a pillow in the near future.